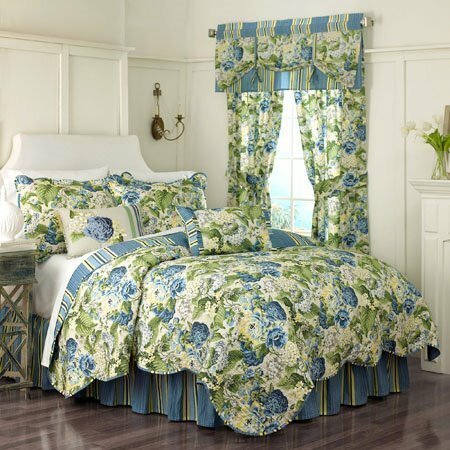 Floral Flourish King Waverly Quilt Set features a beautiful garden of blooms including hydrangeas and peonies in rich hues of blue, yellow, and light green on a clean and crisp ivory ground. A coordinating stripe appears on the reverse of the quilt and as trim on the scalloped edge of the quilt and the shams. Each reversible quilt is crafted of 100% woven pre-washed cotton. King quilt set includes one reversible quilt 104" x 90", one gathered coordinating stripe 78" x 80" bed skirt with a 15" drop, and two coordinating king pillow shams 21" x 36". Machine wash cold, gentle cycle. Tumble dry low. 100% cotton.